There was a public debate at one time in the 1960’s as to who was Scotland’s fastest sprinter. Some said WM (Ming) Campbell and some said Ricky Dunbar. Each runner was said to be happy to face the other but it was not to be. Why not? Because Ricky was a professional athlete and so Campbell was not permitted by the SAAA to race against him for that reason. It was a pity because they were both very good indeed: a friend who was a professional runner at the time spoke of Dunbar coming into the arena after a ‘prep’ looking like superman. Campbell had ‘done the treble’ (100/220/440 titles on the same day) at the Scottish championships. But that’s the way it was. Ricky Dunbar’s story begins back in Edinburgh where as a youngster he took part in every sport available to him but with his ability he was bound to be noticed. He was spotted by Jim Bradley (there is a profile of Jim on this website – just click on his name to read it. Bradley invited him to come and compete at a meeting but when he turned up, he found the number of people about quite daunting and and left. He did go back and, like all runners, amateur as well as professionals in the early 60’s, racing on all sorts of tracks – grass as well as cinder. 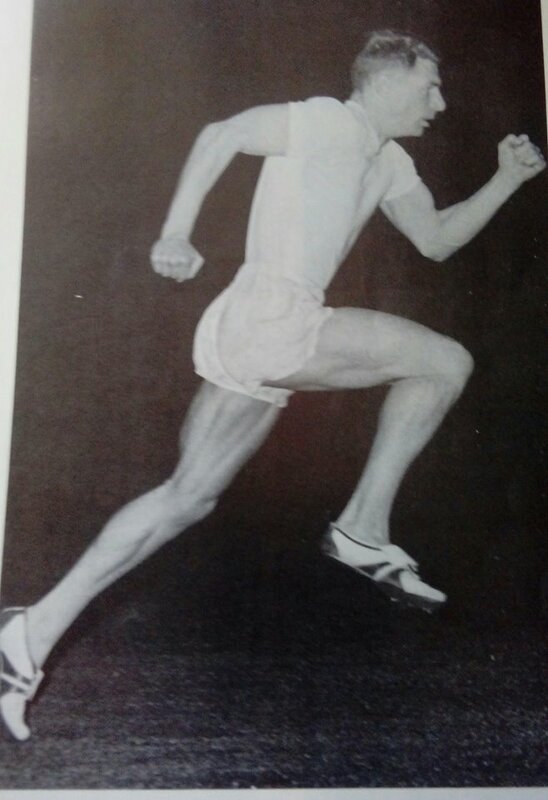 The long preparation time for a single big race, One professional athlete that I spoke to at the time described the preps that the athletes did and spoke of Dunbar coming to Newtongrange and ‘he looked like superman when he stripped off – his skin glowed’. the possibility of making seriously big money by backing yourself. Dunbar went on to become the British professional sprint champion as did his stablemate Dave Walker. One professional athlete that I spoke to at the time described the preps that the athletes did and spoke of Dunbar coming to Newtongrange and ‘he looked like superman when he stripped off – his skin glowed’. There was also talk at this time of matching Dunbar with the top British amateur sprinter WM Campbell and although Campobell was said to be willing, the SAAA put the kybosh on it and refused to sanction the contest. In 1964 Dunbar was unplaced in the 120 yards, if he did indeed run in it, but was third in the 80 yards where he ran off a marl of only half a yard to be beaten by Farquharson of Hawick, off six and a half and Sharkey of Cowdenbeath, also from a six and a half. The report in the Glasgow Herald in 1965 said simply that he was beaten and did not mention him other than that he was not mentioned. The story is probably that he was handicapped ut of it. How good was he? There is information that in 1964 he equalled Ming Campbell’s fastest for the year – running on grass. It is a claim that does not seem to be substantiated anywhere but then how about this one? Although the track used for the annual Morebattle Games is on a grass grazing field, one of the most notable performances was the breaking of the British Native 120 yards. record on 8th August, 1965 by Ricky Dunbar. His time from scratch was recorded by three timekeepers at 11.42 seconds. There have many very good times run on that track in that field, but this one is evidence that he was indeed a top class athlete. Then there was the time when like the time Ricky ran 8 yards inside evens up the cinders at Saughton Enclosure. Why then did he not ever run as an amateur? Flanagan tells us that as Ricky Dunbar saw it, the problem with amateur running, away from the glamour meets, is that the same person wins all the time. Professional running has handicapping. “It gives you a challenge every time you run.” In Scotland, he once gave a runner 17 yards’ start over 120 yards; in Australia, the biggest margin he gave away was 14 yards over 130 yards.” Nevertheless, the amateur selectors were the ones who picked the teams for the big meetings: a reinstated Dunbar would have been eligible for Empire, European and Olympic selection. He is still a very good athlete – one that his family and his country can be justly proud of.